Though it's not exactly a secret that supporting John Kasich is hardly an indicator of genuine conservatism, Buckeye State liberals frequently whine that the Columbus Dispatch is a right-wing rag which gets behind Ohio's Republican Governor at every turn. 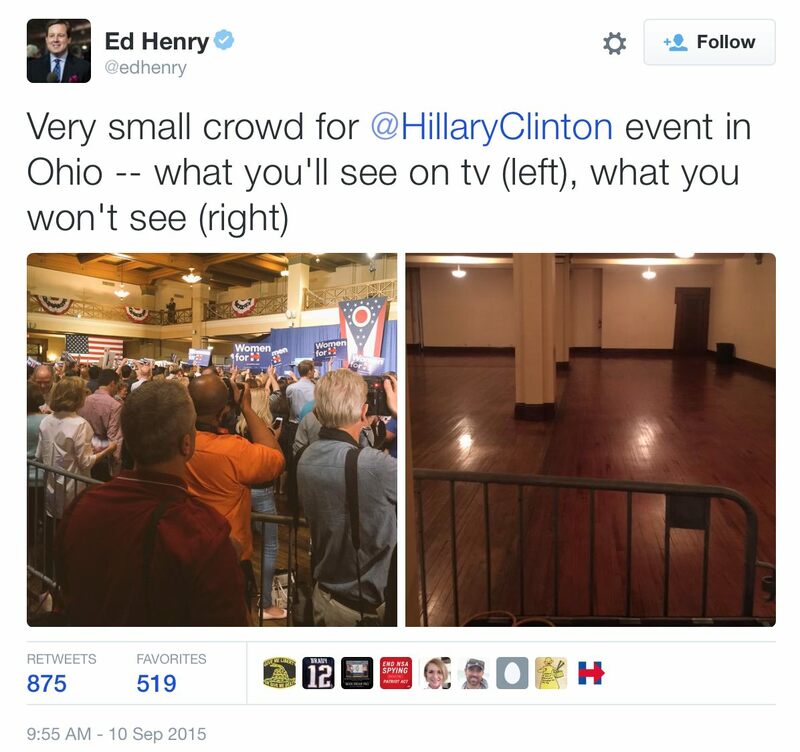 If the Dispatch is so instinctively conservative, how does one explain reporter Darrel Rowland's apparent original exercise in cheerleading as he covered Hillary Clinton's Thursday appearance at the Columbus Athenaeum, a historic building whose meeting hall has a capacity of 1,250? Rowland, unlike his colleagues in the national establishment press, failed to note the existence of quite an expanse of empty space at the event. Geez, Darrel, you could at least have told your readers that Mrs. Clinton's cadre of "adorers" only filled the Athenaeum to 40 percent of its capacity. Seven and a half years after Hillary Clinton exulted in the Columbus Athenaeum when her presidential bid gained new life, she returned to the same venue Thursday hoping for a similar revival for her flagging 2016 campaign. Clinton celebrated in the same facility after a key win in the March 4, 2008, Ohio presidential primary that kept her White House aspirations alive for several more weeks before she eventually lost the Democratic nomination to Barack Obama. ... In her first Columbus visit of the 2016 campaign, her 29-minute talk was long on pledges but light on specifics. To their credit, and in contrast with the Dispatch's failure, two national reporters observed and immediately reported the crowd capacity issue, and the Associated Press — pass the smelling salts — followed suit. The Washington Post's Karen Tumulty tweeted a photo just before 10 a.m. showing "Not exactly a packed house for @HillaryClinton women's event in Columbus." Perhaps because of the above pair of tweets, the AP, breaking past form, actually noticed and reported on the empty space (as carried at its national web site; as carried at the New York Times). The flurry of Clinton activity this week hints at the depth of concern about her national campaign. On Thursday, the modest-sized ballroom in downtown Columbus was half empty for her event, with supporters herded into a cordoned-off area to give the impression of a packed crowd. Perhaps the AP's acknowledgment of Mrs. Clinton's small crowd is an indication that the left and the establishment press (but I repeat myself), recognizing the seriousness of her email/private server scandal, are beginning to turn on her.